Tales from the Borderlands keeps up the strong momentum set by previous episodes in episode four, which ends up being another strong installment in this entertaining series. The best part of the game from a gameplay standpoint has been the extras that Telltale has added for this series. The bionic eye is used well as always, giving excellent information to those who use it on objects, and funny lines to those who had opted to trust Jack earlier. It's not used in puzzles as much in this episode, which is a shame, but it's still a fun addition that is good to have. The story is where Telltale always shines, and this is the strongest of the series so far. Telltale's writers love to tickle your funny bone in their humorous games, and they do so here, in spades. They have the best opening of the series yet, with some of the funniest moments of the series so far, once again set against music that sets the tone beautifully. Jack gets some nice one-liners in, of course, and Gortys is wonderfully naiive as always. There is also an over-the-top action sequence, that harkens back to the first episode. It's heavy in quick-time-events, but, for the scene, it works. Even Telltale's humorous games tend to get grounded at times, and pull at your heart strings as well. This episode has perhaps the most moving moment of the entire series. By the end of the sequence I found myself in tears, which is saying something, as Telltale managed to make me care about a character that I for whom I previously didn't care anything. The ending sequence also had some excellent dramatic moments, and set up a fantastic cliffhanger for the finale. 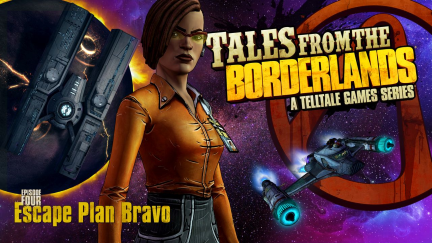 The penultimate episode of Tales from the Borderlands is the best yet. It has fantastic music and the actors perform their lines wonderfully. The bionic eye is still used to great effect when examining objects. The best part about the episode is the story, which delivers equal amounts of humor and drama. The tension rises at the end of the episode, and leaves things on an exciting cliff-hanger. This season has been exciting and entertaining so far. If the last episode lives up to expectations, this series could potentially be one of the best cinematic choice and consequences game they have produced so far.